This is a recent picture of our home school. :-) No, I'm only kidding. 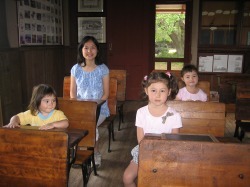 This is actually an old one-room school house that we visited at a historic site in Florida during our recent vacation. The Chinese woman in the back row really is my wife and just happens to be the best teacher in the world. The three girls are my daughters and of course, they are the best students in the world. As is typical with most home schoolers, these girls love to read. That is the main focus of this web site and I hope you enjoy your time here.